Finding the right accommodation for any break you take can be a difficult decision, hotel or guesthouse, self catering, B&B or full board, the centre of town or the outskirts? The options available are endless. 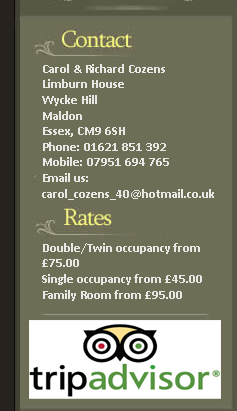 If you are looking for a B & B in Maldon and need some help determining where to stay in Maldon let Limburn House help you decide. If deciding where to stay in Maldon is becoming a problem please take a look around our website - you may find making the decision easier than you originally thought it would be! Limburn House is a private Bed and Breakfast in Maldon offering competitively priced B & B accommodation. This charming Bed and Breakfast is conveniently situated on the outskirts of the historic riverside town of Maldon in Essex and we are able to boast plenty of off street parking, a patio garden to the rear for the use of our guests with the added benefit of beautiful views of paddocks and countryside. All rooms have central heating & double glazing. All rooms have beverage facilities & TV/DVD player, and free Wi-Fi. All rooms have access to shared dining area, kitchenette & patio. Limburn House B & B in Maldon is competitively priced, set in glorious surroundings and provides a friendly guesthouse experience that will ensure you return for repeat stays.